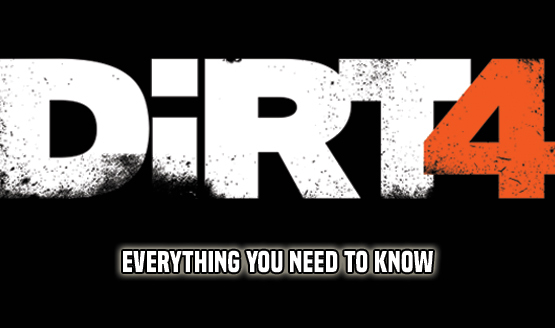 DiRT 4 is the first numbered entry in the DiRT racing series of video games we’ve seen since 2011’s DiRT 3. With a focus on more than just rally racing, and even a new, friendlier handling mode, can Codemasters capture even more fans this time around? Let’s find out in our DiRT 4 review. Right from the start, the first thing you’ll notice about DiRT 4 is that the car models are impeccable. There’s a ton of detail in each of the more than 50 cars on offer, combined with a realistic damage model that makes every crash believable and painful to look at. As you race, your car will get dirty, and the level of detail even in a dirty car is admirable. Who knew dirt could look so appealing? All of this detail in the game’s cars apparently left little room for environmental details. It’s odd to look at DiRT 4 after coming from DiRT Rally, because DiRT Rally’s environments were drop-dead gorgeous. While there are still dense forests, harsh, dry deserts, and freezing slopes to contend with, they just don’t impress the same way that they did in Rally. A game with as varied of environments as DiRT could’ve also benefited from a High Dynamic Range (HDR) color gamut as well, but that too was left out. These graphics slip-ups are hardly deal-breaking, and of course most of the time you’re going to be flying by the scenery too quickly to really pay any mind to some lower-resolution texture off in the distance. Draw distance for courses is essentially infinite, and you’ll always see the track ahead of you in plenty of detail, which is what matters more than anything else. Audio is easily where DiRT 4 outshines its competitors. On the game’s higher difficulty settings, or with assists off, you’ll want to play the game with a surround sound system or a great pair of headphones. An experienced racer’s ear can tell the health of their car by how she roars, and DiRT 4 sounds as realistic as they come. One impressive example of this occurred to me during a later-stage event. I had misjudged a corner, and slammed fairly hard into a fence. The rest of my run had been going pretty smoothly that stage, so rather than restarting, I decided to keep on going. After some time, my hood came off the car, having been dislodged earlier. As a result, the engine audio became much more pronounced, its tortured squeal almost drowning out my co-driver’s calls. To top things off, there are some choice audio tracks that play in your garage and in the game’s menus, though these tracks fade away once the racing starts. The co-driver mentioned earlier is a reliable partner, and a key component of your success in rally stages. They tend to give accurate directions, and when they call out the next feature of a stage can be tweaked to be earlier or later depending on your preferences. They also provide a few words of encouragement before and after events, depending on the physical state of your car or stage performance. 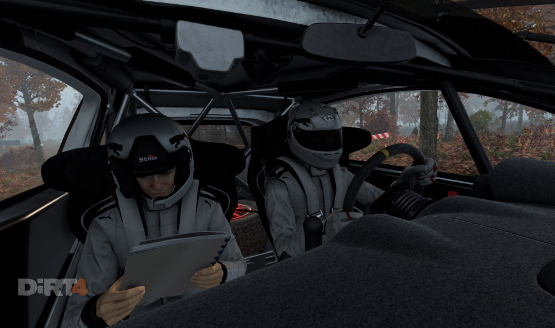 One nice touch that I encountered during my time with DiRT 4 involved the communications in our helmets going out on rare occasion while in the thick of a stage. This likely happens in real life, and adds just a nice extra bit to the believability of the game. There are two different handling modes to choose from in DiRT 4 – “Gamer” and “Simulation.” After I ran through an initial tutorial stage, the game recommended I race at the “Pro” level of difficulty, which is approximately equal to a normal level. However, I paired this with the Gamer handling model, and couldn’t pull off some of the techniques described by the “DiRT Academy”, the game’s decently in-depth set of tutorials. I switched the handling model over to Simulation, and things immediately began to click. I could “feel” my car’s weight shift as I snaked around turns, and could tell when tires were losing grip if I took a corner too quickly. A lot of simulation cues are taken out of the Gamer handling model, almost turning the game into a straight-up arcade racer. For many more casual racing fans, this will be perfect. For those of you who are used to playing a DiRT game with the realism the series has come to be known for, I’d recommend keeping it on Simulation. Turning assists off while in Gamer handling mode would feel like blasphemy of the highest order to racing purists out there, but the option is there if you feel like messing around/getting away with murder. While rally racing is DiRT 4’s bread and butter, Codemasters has ventured out to cover other types of racing that we haven’t seen from them in a while. In addition to the expected Rallycross, which includes racing on and off-road, Landrush features stadium offroading in huge trucks or dune buggies. It’s such a change of pace, featuring slipping and sliding in the dirt, trading hits and jostling for a constantly-shifting leadership spot, jumping into the air and holding your breath as you come back down. There are also historic rally races, where you take classics from the past and race them as best as you can manage, with fewer of those fancy newfangled computers running everything under the hood, and a more romanticized form of engineering characteristic of cars of the era. DiRT 4 also sports a career mode, which is where you earn money based on your performance in order to unlock new cars and licenses to compete in other, more challenging events, as well as to attract sponsorships. Before each race, any sponsor you are obligated to race for may give you an objective to complete before the race event or championship is over. Completing these challenges will reward a payout, as well as increase a sponsor’s relationship with you, which may open the door to higher payouts in the future, and even driving for that sponsor in one of their cars in the future. You’ll also need to manage your team of engineers, hiring them via contracts or into permanent positions as the need arises. Hiring better, and thus pricier, engineers, can make for quicker repairs in-between events, and a generally better-running vehicle. At certain points in multi-stage events, you are given half an hour for repairs without penalty. If you opt to ask your chief engineer for their recommendations, you’ll see an estimated time that it will take to complete those repairs, and thus you can opt out of some of the less-than-necessary fixes if need be. Unless you completely total your vehicle, most repairs will be completed within the half-hour time limit given. Outside of nabbing sponsorships and hiring team members, there’s not a lot more to the career mode than unlocking things. Although the game generates fake event-related news in a ticker in between events, you are never featured in any of that. There are no interviews to answer, or rivalries to conquer, or any of the off-track drama that usually follows racers as they live their lives outside of the cockpit. Perhaps this is for the best, since most people play a racing game to forget about the trivialities of life, put rubber to the road, and get away from everything. On the other hand, in a game about realism, perhaps Codemasters can up their career simulation level in the inevitable sequel. Multiplayer is available in DiRT 4 as well, though server population was predictably low at review time. One interesting feature is the optional inclusion of cross-platform leaderboards. For each course, separate platform-specific leaderboards will be maintained, but by default everyone is opted-in to compete against everyone else, no matter their platform of choice. This should mean that if you have a compatible wheel, you might be at an advantage against, say, a PC player who may have superior graphics and higher frame rates, but no wheel. It’ll be intriguing to see what platform reigns supreme in the contest for ever-shorter lap, stage, and event times. If you’re tired of playing the game’s career mode, the Your Stage mode allows you to generate a practically infinite set of procedurally generated courses, with varying inputs creating nuanced outputs. If you love a particular track that you’ve generated, then you can share your creation on Codemasters’ RaceNet. This makes sharing pretty easy, and means that you’ll never run out of new tracks to race on, which is always an exciting prospect. DiRT 4 encompasses all that it means to race. To spend hours tuning your car, taking it out for a ride to test, bringing it back in to the garage to tweak some more, and repeating until everything is perfect. To have the stressors of the day simply fall away the second the red lights turn off and you are given the “GO” light. To have a perfect run and relish in your victories, as well as to have a devastating setback at the last second, but to learn from your mistakes and carry your head high as you give it another go. Review code for DiRT 4 provided by publisher. Reviewed on PS4 Pro. For more information on scoring, please read our Review Policy here.